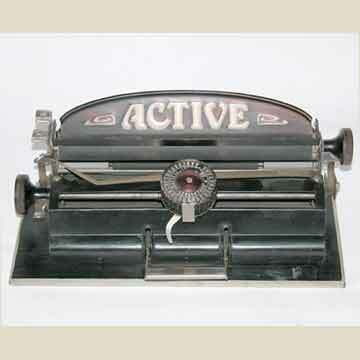 "Active" is the export name for this relatively rare circular index typewriter that was originally marketed in Germany as the Aktiv. The Active is a clumsy little machine made of sheet metal, very similar to toys like the Rico. In fact, sources disagree over the actual status of this machine. Apparently it was not intended to be a toy, but it was mostly sold in toy shops. The Tietze company had earlier produced the equally confusing Famos typewriter (aka Victoria). There are several versions of this machine, with and without the embossed white name on the paper table, nickel-plated sides and serial numbers.